To save some money, we haven’t really eaten out for the past few months. That included ordering pizza, but last week we really had a hankering for one, so I decided to take a stab at making it myself. This was a Daring Bakers challenge a few months back, but I wasn’t able to complete it at the time. The DBers chose Peter Reinhart’s Pizza Napoletana, which requires an overnight rise that I didn’t plan ahead for, so I tried out another crust: Mitch’s Basic Pizza Dough. It formed quickly in my food processor and made enough dough for two medium pizzas with thin crusts, just the right size for our pizza stone. 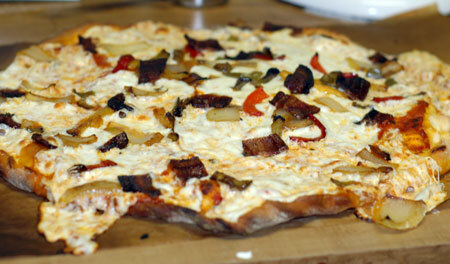 For the first pizza, I sauteed onions and peppers, and pre-cooked a few slices of bacon. I just used a jar of marinara sauce instead of making it fresh, and cut slices of mozzarella. It went in the oven for 10 minutes at 500F. The finished pizza was completely overflowing with cheese (it made a lovely burned mess in the oven), and tasted really flat to me—pardon the pun! The dough was bland, the sauce was a little watery, and the whole pizza lacked seasoning. At least it was edible, and my husband certainly didn’t complain. The second pizza was much more successful, although it had an unpromising start: In a fit of temporary insanity, I just wrapped the leftover hunk of dough in Saran wrap and stuck it in the fridge for the next night. Of course, it proofed more in the refrigerator, busted out of the wrapper, and half of it was covered in a dried-out skin when I went back for it. I was able to salvage a usable chunk, however, and it rolled out just fine. 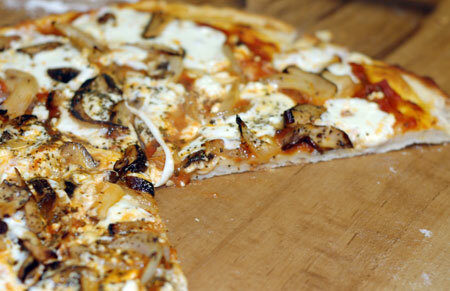 I was more sparing with the cheese this time, and topped the pizza with a mixture of sauteed onions and (reconstituted) dried wild mushrooms, feta cheese (which is incidentally one of my all-time favorite pizza toppings), and dried basil. I seasoned every element this time, and it was much more to my taste, though Jeremy thought it was on the salty side. We will definitely be experimenting with pizza-making again in the near future… I still have to try my hand at that Reinhart recipe! 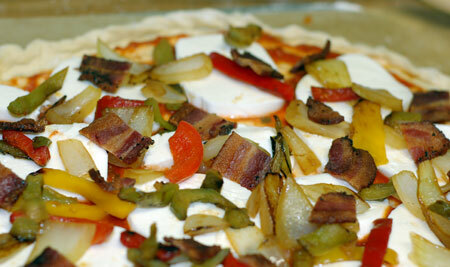 Homemade pizza is one of our favorites. We really like to make “Chicago Style” pizza. The girls get so excited for pizza night!